Damning Evidence – Walk Now Theresa May! Link to 1 minute video of a request by a Manchester Police Officer spoken directly to Theresa May at a policing conference when she was Home Secretary in 2015. Previously awarded a prize for his outstanding policing by May personally, he explains that policing, which he points out is crucial in preventing terrorism, has collapsed due to her cuts, and that he had to resign because he was unable to do the job he loved job properly. He warns of a dire threat to national security if she doesn’t seriously reconsider. In the BBC report linked further down she jaw-droppingly responds by brushing it off as ‘crying wolf’. Resignation Material! Walk now Theresa May! 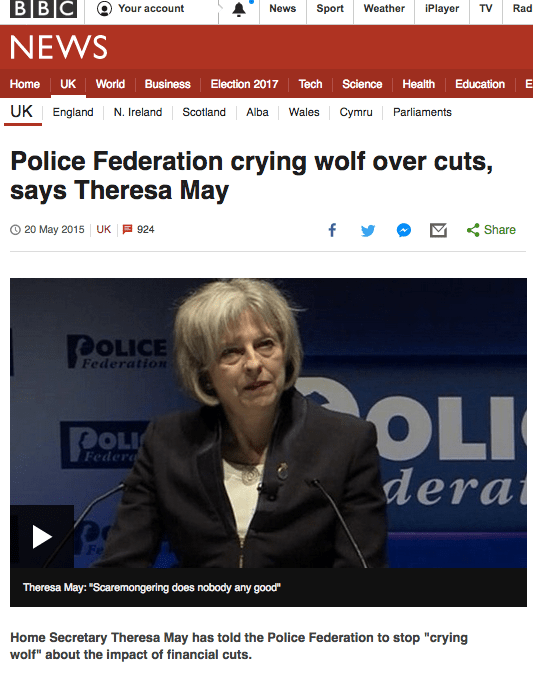 Watch and Read May Mockingly Dismiss These Claims by The Police as “Crying Wolf” – reported here in a BBC report. Jaw-dropping Disdain! We now know that the bomber was reported several times to the overstretched Police and was banned from his mosque for being too extremist: how could anyone possibly stay on as PM after that!?! She Cannot. Walk Now Theresa May! A) It is the source of the Wahabbism ideology that drives ISIS, Al-Qaeda, Boko Haram and other terrorist groups, often painted as ‘moderate’ when serving the regime-change goals of US-UK, and is widely acknowledged as providing them with huge amounts of arms and money. 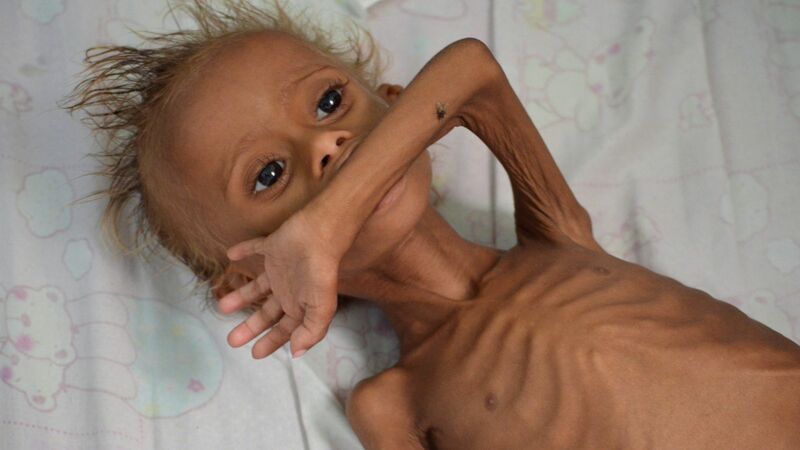 B) Children are starving to death and being blown to pieces in Yemen where British cluster bombs and other British weapons using British warplanes flown by Saudis with British training have been bombing the country mercilessly with and causing a humanitarian catastrophe since March 2015. The country is in shock after the worst terrorist attack in 12 years. The deranged extremist who detonated the bomb bears sole responsibility for the outrage and is not a soldier – for Islam or whoever – but a murderer. The Manchester suicide bombing is an act of barbarism inflicted on entirely innocent people. This wave of terrorism driven by Islamic State, which has claimed responsibility for the attack, derives from a complex infrastructure of forces, working over time. But it springs ultimately from the ideology promoted by the ruling family in Saudi Arabia, Wahhabism, who were at least until recently funding and backing IS: they have done so to support their goal of overthrowing Assad in Syria and championing Sunni Islam in the face of rivalry with Iran. These are Britain’s allies. Whitehall has a deep, long-standing special relationship with the extremist Saudis: it is arming them, backing them, apologising for them, and supporting their regional policies. At the same time, the Saudis have been helping to create the monster that now threatens the British public. So, too, have the policies of the British government. This is terrible, in the true sense of the term: the British establishment is putting our lives at risk in its obsessive obsequiousness in backing the Saudi state. We have to recognise that we are caught between two extremisms – that of IS and that of our own state’s priorities. For two years the government has refused to stop its immoral and illegal arms sales to Saudi Arabia, ignoring and denying the overwhelming evidence that UK weapons are being used in violations of international humanitarian law in Yemen. On 7 February, we took it to the High Court and are now awaiting a judgement. Read more about what our Judicial Review means and how you can support the campaign at this critical time. The death toll in Yemen is now so high that the International Committee of the Red Cross is donating “entire morgue units” to hospitals still standing, having so far escaped the illegal Saudi assault, backed, advised and armed by the US and UK. 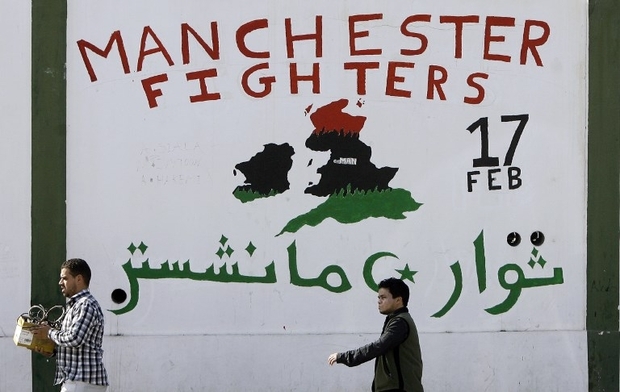 Several former rebel fighters now back in the UK told MEE that they had been able to travel to Libya with “no questions asked” as authorities continued to investigate the background of a British-Libyan suicide bomber who killed 22 people in Monday’s attack in Manchester. 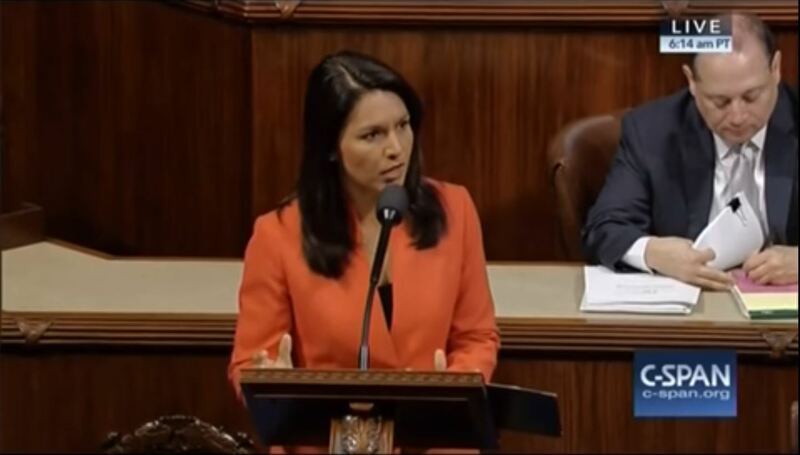 Rep. Tulsi Gabbard’s Stop Arming Terrorists Act (H.R.608) would stop the U.S. government from using taxpayer dollars to directly or indirectly support groups who are allied with and supporting terrorist groups like ISIS and al Qaeda in their war to overthrow the Syrian government. The legislation is based on congressional action during the Iran-Contra affair to stop the CIA’s illegal arming of rebels in Nicaragua. It is endorsed by Progressive Democrats of America, the U.S. Peace Council, and Veterans For Peace.